Though the sinister dynamics of boarding school have long proven fertile ground for fiction, the political premise of this debut strains credulity. It’s a shame that the setup requires such a suspension of disbelief, for the first novel by journalist/critic Antrim otherwise shows considerable promise. As the headmaster of Britton, the most prestigious prep school in the country, Edward Wolfe has left a tenured position at Harvard under shadowy circumstances that some said were political, some said were sexual and could well have been both. A 1960s SDS-er and a sympathizer (or more) with the violent tactics of the Weather Underground, Wolfe now finds himself at odds with his estranged wife, a former hippie who has returned to her family industry that works in league with the Defense Department. 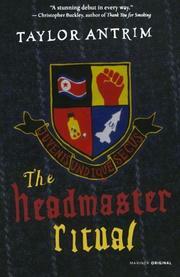 The headmaster wears Mao jackets on campus and makes no secret of his allegiance toward the nuclear-armed North Korea. If the reader can accept the possibility that a vigilant board would allow such a headmaster (who is also in charge of fundraising) to keep this job, the rest gets better. The novel mainly focuses on the parallel stories of two characters: the headmaster’s son, James, a sensitive soul who has been shattered by the breakup of his parents’ marriage and who receives more than his share of hazing, and a new history teacher, Dyer Martin, with no prior experience, plainly there to do the headmaster’s increasingly nefarious bidding. With the headmaster using the children of the ruling class in his attempts to bring the war home, he involves Martin and a select group of students (including James) in a mock UN prep-school forum where Britton represents (you’ll never guess) North Korea. The novel proceeds to a climax in which real-world terrorism intrudes on the students’ hypothetical diplomacy, with the headmaster suspected of even greater villainy than previously known. Various romantic intrigues and unlikely allegiances, in a school were everybody wants something from somebody else, help sustain the narrative momentum. For those who can swallow the premise, the rest goes down more easily.